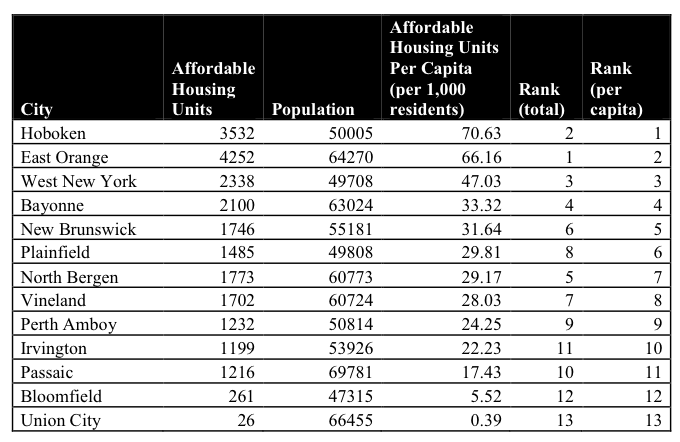 In a publicly issued memo from Mayor Zimmer to the City Council last August, the City of Hoboken is stunningly revealed as a county, regional and statewide leader in affordable housing units. The report has seen scant attention since publicly issued as some residents and officials complain about the lack of existing and new affordable housing in the Mile Square. Affordable, or subsidized housing has been a point of public discussion over many months and highlighted repeatedly in recent City Council meetings. The jaw-dropping report first published in this MSV exclusive (see below) and unreported by any other media shows Hoboken currently has 3,532 existing affordable housing units. Further details based on objective statewide data are equally astonishing. The thousands of affordable units places Hoboken atop the list of 45 urban aid municipalities on a per capita basis. The report states, "Hoboken is a leader in providing affordable housing units and that achievement places Hoboken in the forefront of providers in the State." Hoboken ranks seventh overall but when listed against similarly sized NJ municipalities and the Mile Square outpaced every Hudson County municipality except neighboring Jersey City with 11,433 affordable housing units. Hoboken's neighbor however has a far larger land area and population as the second largest city in NJ. In yet another phenomenal revelation: on a per capita basis, Hoboken also leads Jersey City. In the chart illustrated below, Hoboken's 3532 affordable housing units easily surpasses West New York's 2338 affordable units which has almost an identical population. The Mile Square soundly thumps Bayonne's 2100 units although the peninsula city registers approximately 13,000 more residents. Hoboken easily topped Hudson neighbor North Bergen Township and its 1773 units although its population of over 60,000 exceeds Hoboken. The chart below compares 13 NJ municipalities of similar population with designated ranking. The statewide urban aid leaders in affordable housing units listed in the report are: Newark (22,468), Jersey City (11,433), Trenton (7,777), Camden (6,185), Paterson (5,381) and East Orange (4,252). Hoboken tops the list on a per capita basis and ranks seventh overall right behind those cities. The report presented to the City was authored by Shirley M. Bishop who relied on the New Jersey Guide to Affordable Housing listings for all income-restricted low and moderate income housing in New Jersey by municipality and county. She indicated the guide was the reference used to calculate affordable units in 45 municipalities. The data comparing affordable housing units in Hoboken and across NJ is sure to surprise people on all sides of the affordable housing discussion. Some additional units are coming online with others being removed but the figures overall are far higher than anticipated. The report does not provide any tax impact analysis. It concludes however, the City is well positioned to meet potential state standards "whenever an obligation is forthcoming," due to its credits of affordable units in excess of 700. Hoboken taxpayers are likely to question additional costs in any systematic government led effort to increase subsidized housing units seeing revenue losses impacting the City budget. The full unedited report from Mayor Zimmer to the City Council last August and available to the public since last summer is provided below. Talking Ed Note: While the Hoboken Housing Authority and its buildings officially have income based standards, much of Hoboken's affordable housing stock does not. Lacking comprehensive accountability on the existing thousands of affordable housing units, political wrangling (or worse) featuring class warfare, birther "credentials" and political bomb throwing should be expected. The Old Guard political class relies heavily on subsidized housing residents as its voter base. Old Hoboken is shifting, looking for value in city services, government accountability and true bang for the buck as many are business and homeowners paying city taxes. While Hoboken has seen approximately a 10% reduction in taxes since Mayor Zimmer took the executive seat, Hudson County taxes rise annually sometimes in double digits and have overtaken municipal taxes as the highest portion for taxpayers with no relief in sight.